Home/Authors, books, freelance writing, new books, speaking/Are you an aspiring writer? Almost every week, I hear from someone who wants to write. They write me brave emails, looking for a word of advice or encouragement. It’s one thing to be a writer–anyone with a pen and a scrap of paper, or a computer, can write. But being published, or even self-publishing–in other words, being an author–that’s another thing altogether. And typically, the people I hear from want to be an author, not just a writer. Maybe that’s you. They typically don’t have any idea what they are getting into. I try to be gentle in explaining that writing is just the beginning. An author’s job also includes marketing their work. It’s tirelessly working to connect with your audience, and grow that audience. They’ll need to network, to engage on social media, blog, and speak about their book. Part of my work is to help authors market their books. To tell their own powerful story. I was consulting with a client this week who had an opportunity to speak at a prestigious university, to a group of student bloggers, and didn’t mention his book, for fear of seeming mercenary, self-promotional, or having them think that he was only there to sell books. He thought mentioning the book would somehow erode his credibility. An invitation like that is much less “self-promotional” and much more inviting. It’s also a very effective way to market your book, and build your platform. And you can have your book featured front and center on your website—along with a way for visitors to engage with you through comments or a contact form. Along with helpful content that they can read and enjoy without having to buy anything! An author website is the hub of your marketing platform. Want to learn more about marketing, platform and so on? 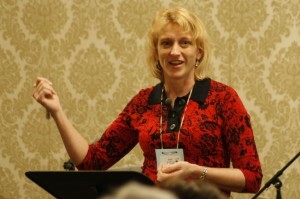 I’ll be teaching the marketing track at the West Coast Christian Writers Conference Feb. 20-21. It’s not too late to sign up to join us. In fact, use the code KERI10 to get a discount on registration. Since I’m spending time preparing my four talks, I thought I’d share some of the content I’ll be presenting at the conference here on my blog over the next few weeks. So tomorrow I’ll share some practical suggestions on what to include in an author website and how to make it work best for you. If you’re on the west coast, or just looking for a chance to escape winter and spend a weekend on the west coast, join us in Fremont, CA next month!